On the 14th (Fri), see some colorful creatures with a scuba or snorkeling tour. For reviews, traveler tips, photos, and more tourist information, go to the Cairns online tour itinerary planner . Rochester, USA to Cairns is an approximately 31-hour flight. You'll lose 16 hours traveling from Rochester to Cairns due to the time zone difference. Traveling from Rochester in June, plan for a bit warmer nights in Cairns, with lows around 66°F. Wrap up your sightseeing on the 14th (Fri) early enough to drive to Port Douglas. Start off your visit on the 15th (Sat): see some colorful creatures with a scuba or snorkeling tour. For photos, maps, more things to do, and other tourist information, read our Port Douglas trip itinerary maker . You can drive from Cairns to Port Douglas in 1.5 hours. Alternatively, you can take a bus; or take a shuttle. In June, plan for daily highs up to 79°F, and evening lows to 65°F. Wrap up your sightseeing on the 15th (Sat) to allow time to travel to Sydney. Start off your visit on the 16th (Sun): kick back and relax at Bondi Beach, tour the pleasant surroundings at Bondi to Coogee Beach Coastal Walk, then admire the landmark architecture of Sydney Opera House, and finally pause for some photo ops at Mrs Macquarie's Chair. 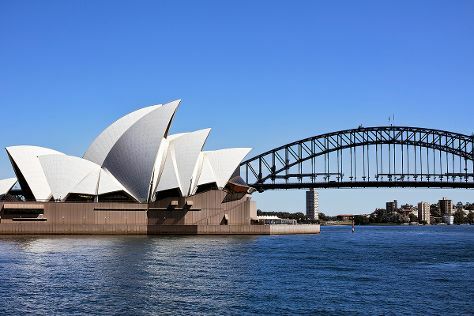 Get ready for a full day of sightseeing on the next day: admire the masterpieces at Art Gallery of New South Wales, admire the natural beauty at The Royal Botanic Garden, then wander the streets of The Rocks, and finally don't miss a visit to Sydney Harbour Bridge. For more things to do, reviews, and more tourist information, you can read our Sydney driving holiday planning site . Getting from Port Douglas to Sydney by combination of shuttle and flight takes about 7 hours. Other options: drive; or do a combination of bus and train. Traveling from Port Douglas in June, things will get little chillier in Sydney: highs are around 65°F and lows about 50°F. Wrap up your sightseeing by early afternoon on the 18th (Tue) to allow enough time to travel back home.